The proposal to completely demolish existing Luzhniki stadium, to be replaced by a purpose-built football stadium, emerged as Russia was preparing for the 2018 World Cup. This solution was widely expected to be cheaper than retaining monument-listed outer walls of the old stadium and building new stands inside. Global leaders in stadium design Populous were asked to design the new futuristic stadium. 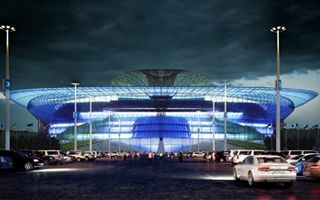 It was expected to not only completely redefine the area (while respecting existing symmetry of the leisure complex), but also be a new landmark of Moscow and icon in stadium design. The outcome was an extremely controversial vision which raised quite some eyebrows, but not entirely in the positive way. The generously glazed outer cover was topped with a steel “tripod” reaching inside the stadium and becoming primary support for the giant screens. Also part of the permanent roof structure, this structure was to be the defining aesthetic and structural accent. The seating layout would be far more traditional, but still very interesting. Despite holding over 80,000 people, stands were divided into only two rings. Skyboxes were placed in the upper ring along both sides of the pitch, topped with additional corporate facilities under the roof. Should there be higher demand, room for additional temporary sections was created atop the stands behind both goals. The concept was eventually scrapped after consultations led to preservation of the historical walls and dome of existing Luzhniki stadium. The currently ongoing project is expected for delivery next year (reopening in 2017) and should cost roughly RUB 20 billion.